The Bianchi’s worked with Grace Design Associates to create their own Shangri-La that sits lightly on the land blends in naturally with the surroundings. Photograph by Amy Barnard. Generous use of color and texture spotlight Penny Bianchi’s great eye for detail. As an interior designer for nearly 50 years, she uses her own home to showcase her designs. Photograph by Amy Barnard. High ceilings and plentiful windows fill the home with light throughout the day. The main entrance leads into a spacious hall, which leads to the bedroom (there’s only one) and master bath on one side, and kitchen, office and guest bathrooms on the other. Adam Bianchi works in the office—he sold his family’s poultry business 30 years ago and has run Penny’s business operations ever since. Penny changes the furniture slipcovers several times a year so the mood always reflects the season. As an interior designer for nearly 50 years, Penny Bianchi uses her own home to showcase her eye for detail to charming effect. Photograph by Amy Barnard. Treasures that appear at every turn include antique lace lampshades and oriental rugs, screens and other works by French artist Marcel Vertes, shower tiles from 17th-century France and an 1860s bathtub from Paris. The guest powder room features bird murals with bird figurines that hover over the walls. The kitchen has furniture pieces rather than built-in cabinets. Views of the gardens—designed by Grace Design Associates—are always on display from the Bianchi’s breathtaking country kitchen, photograph by Amy Barnard. The gardens, designed by Grace Design Associates, are a welcome haven for humans and wildlife alike. The National Wildlife Federation has named the Bianchi property as a Certified Backyard Wildlife Habitat, which means it provides the basics needs for wildlife: food, water, a roof over their heads and a place to raise their young. Carefully selected trees and shrubs nourish and protect ducklings and other creatures, and floating houses anchored in the middle of a pond allow nesting ducks and their offspring to escape from predators. 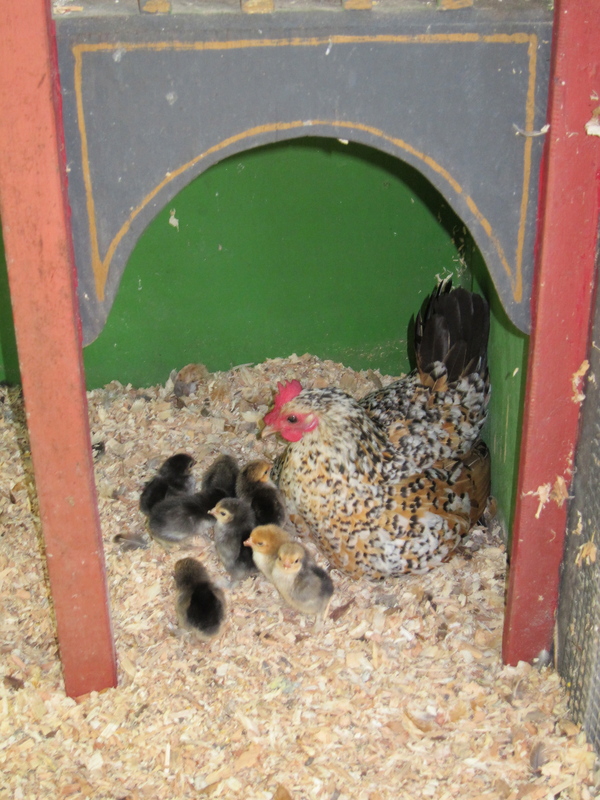 Heirloom chickens roam free during the day and put themselves in the coop in the evening for protection. Heirloom chickens happily roam free during the day, along with multitudes of other wildlife. The Bianchi property is a Certified Wildlife Habitat. Photograph by Amy Barnard. Views of these glorious gardens (designed by Grace Design Associates) are on gorgeous display from Penny Bianchi’s indoor/outdoor office. Photograph by Amy Barnard. All in all, the Bianchis have successfully created a haven in which every nook and cranny evokes coziness and a connection with the natural world. In Penny’s words, it’s “a cozy, collected and patina” home where they, their grown children and seven grandchildren thoroughly enjoy daily life in a remarkable Montecito setting. This is an updated version of a post from 2011! Our house was briefly on the market then. Then we took it off! So glad it didn’t sell! I have always been a lover of gardens, especially the wild ones! I love statues, birdbaths, and accessories (although when overdone; I am reminded of a cemetery)! Two of my most prized possessions are a pair of terra cotta sphinx that sit on the entry way to my house. Monterey Colonial garden update! Big difference!!! purchased a few years ago here in Montecito! The previous posts are at the end of this post! over the property; so she moved them all here. When they bloom under the purple blossoms it will be a show! Here is the front porch with the Anduze pots with topiaries. Everything simplified! there is a lovely new gate in the background on the left. It was made to match the back gate. Around the back of the house; she has added oak leaf hydrangeas, and star jasmine. Another new gate to match the back gate! The pool is on the other side! Remember when you couldn’t see the pool from the garden? She opened up the hedge! It is still private; but you have a glimpse! The beds are also simplified with white agapanthus, iceberg roses and Viburnum. 3 avocado trees all different species so they fruit at different times! My favorite! Lavender, matillija poppies, artichokes and herbs! And roses! I think they are doing a beautiful job of this garden! Congratulations to our daughter, her husband and their gardener!!!! Three weeks ago, a hen of ours went missing! I was afraid a coyote or hawk had taken her; but I couldn’t find feathers anywhere! About ten days later, I found her outside the coop in the morning, and I knew she must have made a nest outside of the coop! This year Easter greeted us with a beautiful day and a fun filled event with family and friends. We celebrated at a friends farm, known as the Lemon House. Where what used to be a lemon packing house, a young family of four now resides. Present at the party were three generations of several families; the hosts are close friends with our daughter Ella and her husband and children.